Conrad Dillman was a wealthy farmer from Center County, Pennsylvania. He and his family migrated to Green Township around 1813. He and his family first lived in a log cabin and farmed several hundred acres. In 1832 Mr. Dillman built this new brick home. There were only a few dozen families in Green Township during this time and life on the Ohio "frontier" was very lonely. Circuit Riders began routes through the Canton area that included Green Township and the Dillman home was a welcoming stop for Methodist and Evangelical preachers. lest his fellow settlers, deprived as they were of religious worship, depart from their faith. So with Bible in hand he went from cabin to cabin, teaching, exhorting, and praying with the people in their new and primitive surroundings. Eager for gospel preaching they gladly joined the Methodist organizers who were the first to proclaim the Word of God among them.” For many years circuit riders used the Dillman home as a shelter and place of worship. 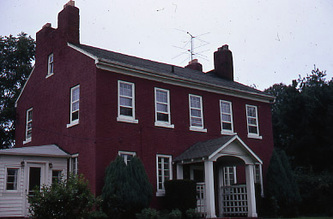 The Dillman Home is a brick colonial with a 5-bay facade. A double chimney with a window in between each chimney at the third floor can be found at each gable end of the home. 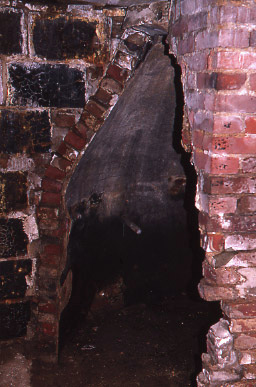 This architectural feature resembles the pent chimney home styles of Colonial Maryland and Virginia.